Enter the dimensions and the number of pots you have to give you an approximation of how much compost you'll need. Measure your pots in cm, the diameter is the furthest distance across the top of the pot, the height is the vertical height of the pot, best measured inside right in the middle. Click here for to learn more about Baytree's own brand of compost. 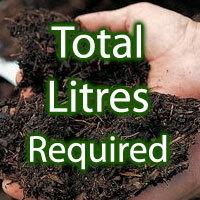 Please consider this widget will only give a rough guide to how much compost you'll need. The calculation is based on the pot being truly cylindrical, which it probably isn't. It does not allow for settling and compression of the compost, but that is probably compensated for by the chamfer of the pot. In short, we accept no responsibility for the results of this form, we only provide it for use as a guide.